Home › ModernTribe's Blog: Modern Jewish Life & Style › Have We Arrived? Organic Google Search Finds Moderntribe.com. Sort of. Getting ones new website to show up under a general word search is very difficult. So I was thrilled today when I googled for Hanukkah. Jennie Rivlin Roberts noticed many young Jews acquiring multiple menorahs on their own, to suit their more modern tastes, and started an online company, ModernTribe.com, selling "hip Judaica" to serve them. She says the nadir of menorah design was in the 1980s, when brassy models were popular. "I have a really ugly brass menorah from my family," she said. "I take it out every year and light it, but it's not at all my aesthetic taste." ..the picture is of me and my daughter with my "ugly menorah"! 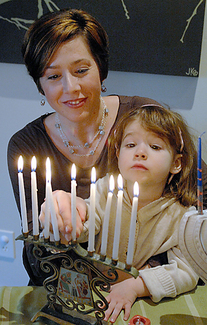 did you know this picture was also used on The Slate in an article lambasting Hanukkah? Tis true! I can’t decide whether to ask Slate to remove my sweet daughter’s image from this caustic post. Boy Christopher Hitchens really is a Hanukkah scrooge!